Sustainability. Mother nature never stops working. 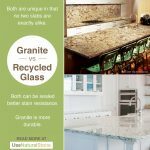 So yes, granite is a “renewable” resource. 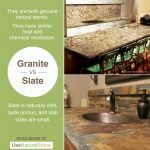 However, since it takes thousands of years to create, many industry professionals do not consider granite a true green product. It is important to note the stone industry has made huge strides in recent years to adopt responsible quarrying and production practices. 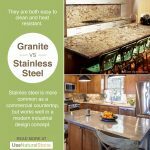 Since granite countertops can last a lifetime, contain no harmful chemicals and do not emit harmful radiation or gasses, they have a place in the green building movement. Heat Resistance. Granite countertops will not melt or blister when exposed to heat. They are one of the most heat-resistant countertops on the market. If you take a hot pan out of the oven, you can place it directly on your countertop surface without any harm. Experts do recommend the use of a trivet when using appliances that emit heat for long periods of time, such as crockpots. Since the material is so dense, there is a small possibility heating one area of the top and not the entire thing, could cause the countertop to crack. Scratch Resistance. Granite scores a seven on Moh’s scale of hardness. This means that very few minerals are able to scratch it. You can cut on it, but it isn’t recommended since this will dull your knives and possibly leave a metal residue behind that can be difficult to remove. 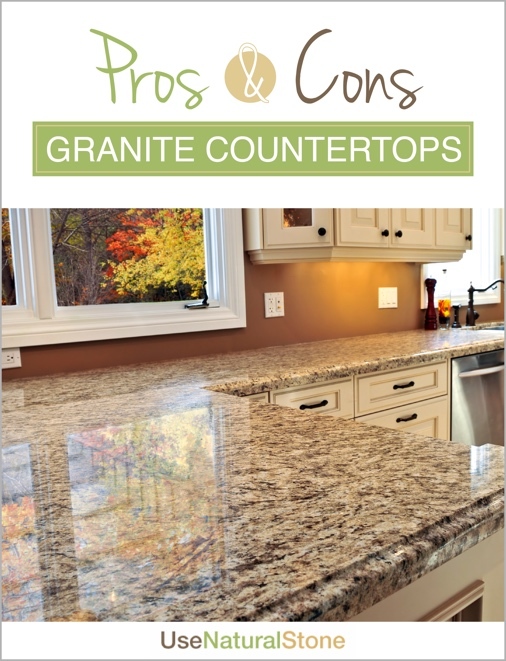 Seams: In a typical kitchen, granite countertops will need to have 2-3 seams. 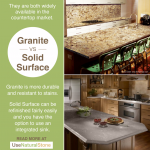 Depending on the color of granite you choose, average slab size will vary. A typical expectation can be set at 9 feet by 5 feet. Large islands can typically be done without seams. If you have an L or U shaped layout, expect seams where the countertops angle in a different direction. The good news is that many fabricators will mix custom color epoxy to adhere the seams together which does a great job at disguising them. Expect the seam to be around 1/8-inch thick. Undermount Sinks. Undermount sinks are common in granite countertop installations. This allows crumbs and spills to be wiped directly into the sink without being caught on the lip of a surface mount sink. You can consider using several types of sinks including cast iron, stainless steel or solid surface. Fabricators will cut and polish the sink hole to match the shape of your chosen sink. Backsplash Options. 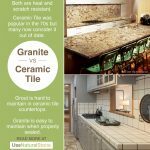 Coved backsplashes that are common in laminate countertops are not available with granite. Typically, a separate 4” piece of the stone slab will be adhered on top of your countertop surface. Tile and full-height granite backsplashes are also used. Repairs. 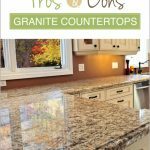 Granite countertops should be repaired by a professional. It is rare to get a crack or chip in your countertops, but if you do, contact the fabricator who installed your countertops to schedule a service call. Most of the time, a color-matched epoxy can be used to fill the void and it will be virtually invisible. In a pinch, you can use superglue to fill a chip. If you use heavy cast iron pans, be careful when placing them into your under-mounted sink. The edge of these cutouts is the most common place to get chips. A more likely scenario, though, is to experience an increased number of broken dishes. Sealing. Granite is a porous material. Most fabricators will apply a sealer to granite countertops before they are installed which will protect them from absorbing liquids too quickly. Being porous is not necessarily a bad quality. If liquids are left on the surface for long periods of time, they will eventually absorb. But just like they absorb, they will also evaporate. Depending on what the substance is that needs to be removed, you can apply different poultices to speed the process along. However, many will evaporate on their own without the use of chemicals or cleaning products. 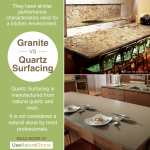 Other countertop materials such as solid surface and quartz surfacing are non-porous. There are things that can stain them though, such as permanent marker which can be removed from granite. Maintenance. Granite countertops are considered to be alow maintenance countertop surface. The likelihood of needing to be repaired or resurfaced is low. Technology for sealers has come a long way over the years, and many will last more than 10 years before needing to be reapplied. When they do need to be reapplied, it is something that most homeowners can do on their own as the process is similar to cleaning. Simply apply the product and wipe off the excess. It is a good idea to ask your installer which sealer was initially applied and use the same kind to reapply. Some sealers don’t play nicely with each other and when mixed, can create a sticky mess. Price. The average price for granite countertops in a typical kitchen is $3,000-$4,000. There are a lot of variables such as edge profile, total square footage, backsplash, etc. Don’t be fooled by the stereotype that all granite is expensive. 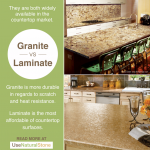 Lower-range granites will cost less than high-range laminate. 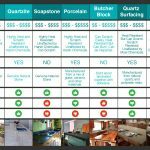 Though granite countertops are not considered “low range” in pricing, there are a lot of affordable options that will start at around $35-$55 per square foot. Do be careful when comparing pricing between different companies. Make sure you are comparing apples to apples. Your final quote should include material, fabrication and installation. Exotic Options. 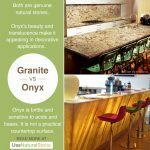 If you are looking for something truly unique, consider an exotic granite. As with most things in life, price is determined by supply and demand. Some quarries are not easily accessible and/or only able to be quarried for short periods of time throughout the year. If these circumstances exist in a quarry with gorgeous stone, the price will be driven upward. Some granites reach over $400 per square foot. Colors Available. 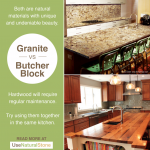 With all natural stones, including granite, we are limited to the colors and patterns mother nature produces. You won’t find a lot of solid patterns or bright colors, but both do exist. Also, watch for a large range of color and pattern within the same color of stone. It’s always a good idea to view the exact slab(s) that will be fabricated for your kitchen to make sure they are what you expected to see from the sample. Another factor is that many exotic types of granite have huge flowing waves, and a small sample will not be an accurate representation of the whole slab. 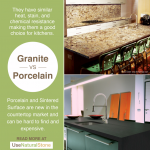 Granite is not considered one of the countertop surface options with a wide range of colors. You will find a wider range of options with laminate, solid surface and quartz. Stain Resistance. In general, darker granites are very dense and sometimes don’t even require a sealer. 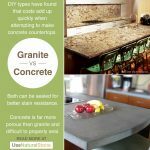 Lighter granites are more porous and may require multiple coats of sealer to be considered stain resistant. 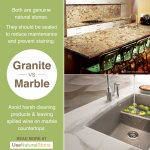 Either way, if properly treated, granite is a stain-resistant countertop surface. Genuine Natural Material. You buy organic food, right? Eliminating, or at least reducing, our exposure to chemicals and additives has proven beneficial to our health. 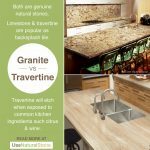 Genuine natural stone including granite, marble, travertine, and others, are the “natural choice” for countertop surfaces. They are quarried from the ground and their natural state, and sliced into slabs for use in your kitchens. 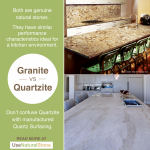 Though quartz surface materials claim they are also natural stone, the reality is they are mostly resin, with a small percentage of crushed natural quartz. Resistance to Chemicals. 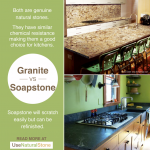 Granite countertops are very resistant to chemicals. Acids and bases will not harm the material. Do be careful of repeated use, though, as some chemicals will wash away the sealer over time, causing the need for re-sealing before the recommended time.